The 2008 trip began as all other did, with Outers flocking to the shop by 8:00 AM. The pressure to get off to an early departure was no longer a factor, as today’s travel would be quite short. The trailer and bus were loaded up and we were on the road by 9:35. We had 19 people in total going this year. Quetico 20 foot cedarstrip Trent A.
Dumoine Cedar Strip Kris L.
Quetico Cedar Strip Jean H.
Winisk Cedar Strip Jay T.
Rubber Duck #4 Leena T.Anthony A. Plans for this year’s trip had been exciting and extensive. We had hoped to open up portions of routes that had not been used by Outers in over ten years. The Kowkash River and Meta Creek were the two main objectives of this trip. Completion of the trip would have created a very large circle route. However, Mother Nature was not going to cooperate this year. 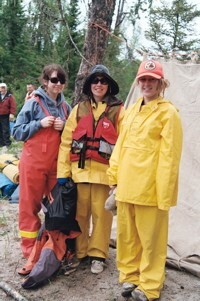 With only a week left before the departure date, staff was becoming very nervous about water levels. 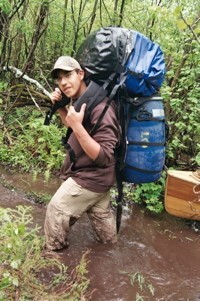 They were at an unprecedented high, so a week before the trip started, the Kowkash River was ruled out. High water levels became the defining influence of Spring Trip 2008. Our trip took us up Highway 584 to the Aroland turnoff, and then onto the Ogoki Road. The Ogoki Road was in excellent condition this year, far superior to the Aroland highway. We reached the bridge over the Kapikotongwa River at 12:15 PM. 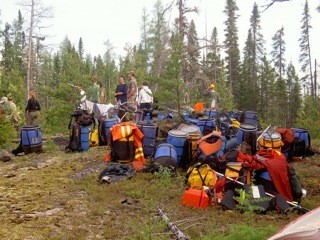 Unloading and lunch were conducted with lightening speed. 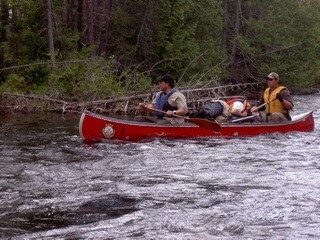 At 1:07 paddling began downstream on the Kap. It was approximately 15 kilometers to the campsite, and the rain began its first of many appearances over the next several days. We were striking out for the Esker Hilton, an aptly named campsite due to its beautiful beach nestled in the crook of an Esker. We arrived at the designated coordinates at 4:20, but were at first unable to recognize the campsite. The Esker Hilton had turned into the Muddy Flop House. The entire beach and most of the camping area was underwater. Much pondering occurred until Brigade Leader Trent formulated a plan. Brigade tents then rose quickly, with much praying that the wind would remain docile during the night, as a strong blow would have sent waves through the tent. 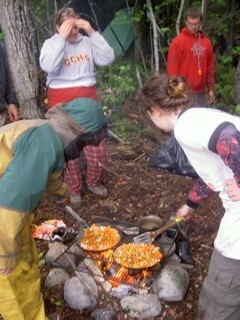 Cooks set to work on the customary first night spaghetti meal, while firemen docked canoes and chopped firewood. Despite the wet weather, spirits were high. Lights were out at 11:00 PM. Three old guys doing nuth’n. Josh just a givin’ er! Outers slept in until the ripe old hour of 6:00 AM. A cold, wet morning was made warmer by the excellent breakfast of sausages and eggs. Unfortunately, that was the last warm moment of the day. 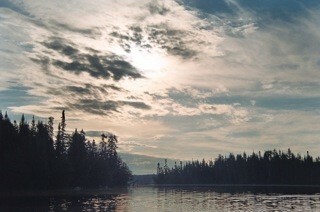 Paddling started at 8:00 AM, destination Stone Lake. Berger Lake was reached by 9:40, about the same time the cold began to sink deep into our bones. Several people were chilled, and rest breaks became more hazardous than helpful, as the only remedy to the cold was to continue paddling. 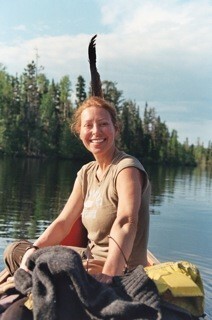 Peon Leena was switched into Staff Haslam’s canoe, while Staff Clavet took over sterning Leena’s canoe. 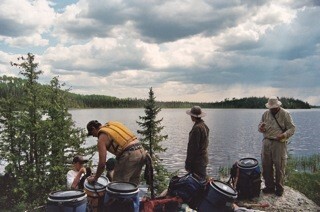 Stewart Lake was reached at 11:50, and the shivering Outers quickly occupied the bug hole campsite on the northwest corner of Stewart. 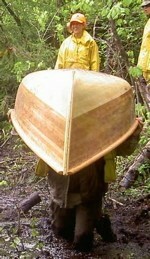 A few of them, including Haslam, had found out that their rain gear was defective, and warming fires were badly needed. Winds from the Northwest made the cold worse, so shelter was sought. Amazingly, we had no bugs all day yesterday, and today, the bug hole site was sans insects….shocking! 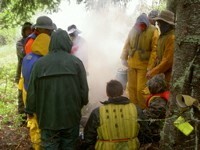 A slow lunch over two fires gradually brought warmth back to the crew, and we reluctantly departed at 1:35. So cold our breath was showing. The paddle down Stewart Lake and through the channel to Stone was a tad warmer. The temperature was up to 11.5 C, and the rain was only intermittent. The port was reached at 2:40. The normally difficult entrance was made quite a bit easier by high water, which enabled us to paddle about 50 meters into the port. The Outers flew across the port and were paddling again by 3:45. 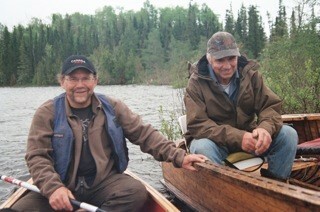 Ex Outers Rob and Edgar Lavoie were stupefied by the speed of the crossing….nine canoes and nineteen people in an hour. The real fun of the day was now about to begin. 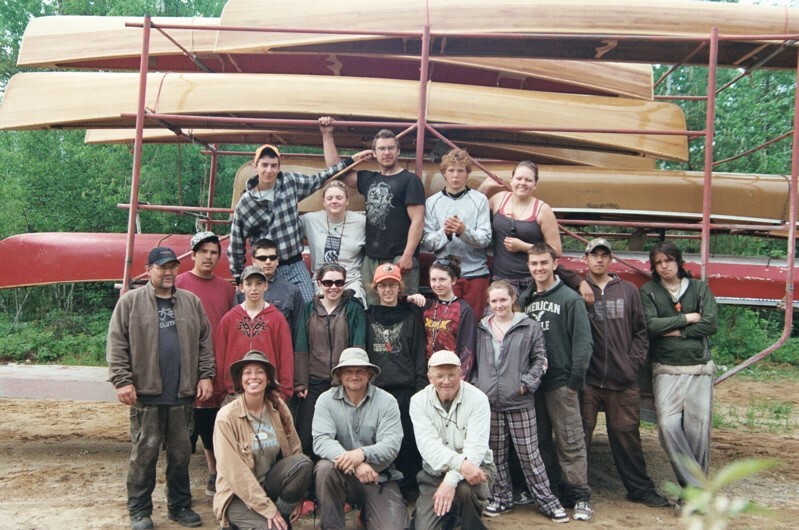 Canoe partners had been reworked at Stewart Lake to try to achieve the perfect balance. Peon Sydney was now sterning for ABL Anthony, while Fireman Jean was sterning for Kaitlin. Peon Josh was sterning with Cook Sadie. They were about to receive their first trial. Stone Lake is entered through a small creek that flows into Stewart. This is usually a stiff paddle through strong current, but with the current high water levels, the paddle into Stone was now very tough. Staff canoe Haslam and Clavet went up first and found a line. They shouted back to follow “one at a time”, but apparently the instruction was lost in the current. Sydney and Anthony were almost through when Kaitlin and Jean cut them off and collided. Several seconds of chaos followed, until Anthony and Sydney turned over and sunk. 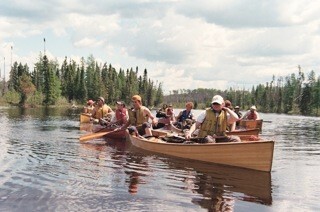 They took it well, with humour and laughter, and helped pull the rest of the canoes through. At 4:20, the paddle down Stone Lake began. 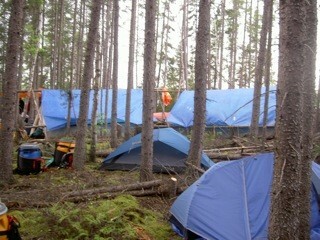 A big tail wind came up and pushed us into camp at 5:03. This camp had been extensively cleared last year, so only minimal pruning of trees was needed. 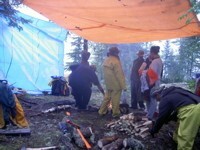 Wind tarps were set up quickly, and people began the task of warming up and drying clothes. Two American fishermen stopped by for a visit, and left us with some fish to supplement the evening meal. That was probably a good thing, as the Stroganoff was just a hair shy of disgusting. The remainder of the night was spent drying clothes over the fire, and avoiding the sporadic rain. Making up for the Stroganoff! Rain fell off and on all night, and temperatures continued to be cold. Camp slept in until 7:00 AM, and then proceeded with a slow and leisurely breakfast. The upcoming port between Stone lake and Ara Lake was known to be very wet, so the idea was to wait a bit for the cold temperature to rise. 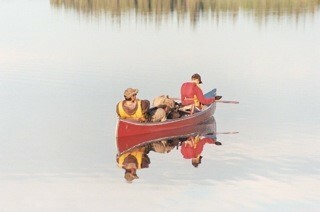 At 9:50, the Outers hit the placid waters of Stone Lake. 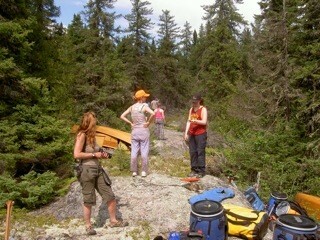 There was a fair amount of dread mixed with excitement regarding the upcoming portage. At 1. 6 kilometers, it had a difficulty rating of extreme due to the large, wet loonshit holes. At 10:20 we hit the port. Staff Lavoie went ahead and began cutting. Haslam and son had cleared the port two years previous, but by the sounds of the continual whine of the chainsaw, it soon became apparent that a major clearing job was underway. 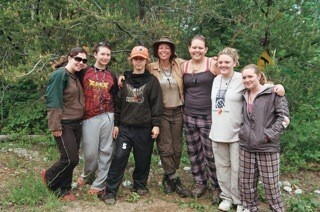 Outers started porting at 10:50, and very shortly they hit the first major mud hole. Staff Lavoie had cut a branch bridge around it, but many found it easier just to walk through the middle of the small pond. The port soon became known as the “Port of Screams”, as high-pitched shrieks rang through the jack pines and echoed in our heads. The port had some dry spots on it, but only enough to tease. The last big mud hole was particularly bad, probably spanning a 300 meter stretch, and it facilitated several noxious wipeouts. 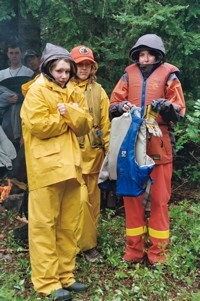 Students actually disappeared under their canoes, and had to be rescued from slow mud-sucking death. Those pants used to be white! I like Peanut Butter, me! Porting was finished at 3:30, and despite the loonshit that covered everyone from head to toe, lunch was devoured with glee. Leaving the port was fairly time consuming as well. The exit was bad at the worst of times, but it was now underwater and mixed with a healthy helping of loonshit. Canoes floated but resisted movement on this pernicious mixture of organic debris, and the dirt that now covered canoes, bodies and packs was reflected in the language that escaped from many mouths as they poled and pushed their way to clear water. The next challenge was to find a campsite. 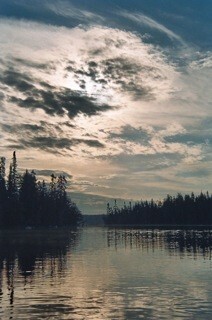 There are very few campsites on Ara and Meta lakes. 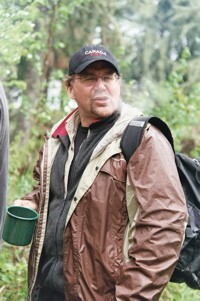 Outers crawled east along the north shore of Ara, and scouted several possible sites. Most were swamps. 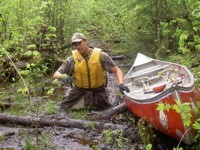 A beaver dam that was at least six hundred meters long was found, and considered. 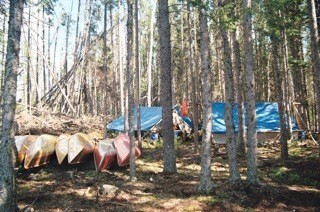 The Outfitters camp on the north shore was inspected, but the ground around it was sodden clay, so Outers moved on again. A possible site had been indicated on some old Outers maps on an eastern point just before the North Channel of Ara Lake. We reached this at around six o’clock. It was the tail end of an old esker, and there was indeed a campsite on the eastern side of it. Although quite small, the mad cuttings of Staff Lavoie’s chainsaw soon opened it up into a good site. 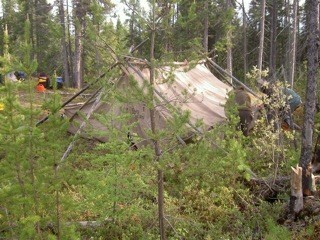 This new camp was a great find, as it put us in an excellent position to make an early morning open water crossing. It had been a long day, and wake call was at 5:00 AM the next morning, so everyone retired by 10:00PM. The rooster crowed at 5:00 AM to get Outers up for the big paddle down Meta Lake to Meta Creek. 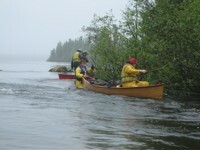 Light fog covered the water as groggy Outers prepared breakfast and loaded canoes. 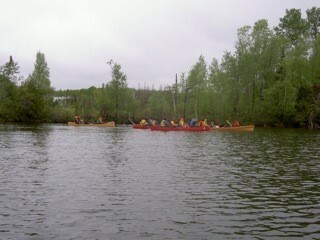 At 7:00 AM, the 9-canoe brigade hit the water. Navigation would be by GPS this morning, as the fog made the distant shoreline invisible. This was one of the few necessary open water crossings that the Outers still made, and this one was uneventful. The GPS lead the crew straight across the narrowest part of Ara Lake and then shortly thereafter to the Ara-Meta Channel. Outers proceeded north on Meta under perfect conditions, and reached the end of it by 10:30. They continued down Meta Creek to the entrance of Brace lake and had lunch at 11:40. Pepperoni and cheese whiz and flatbread seemed to cause a panic in the bushes, but by 12:10 we were under sail again. The first port of the day was reached at 2:20. Haslam and Staff R. Lavoie had come up Meta Creek in 1999, and the volume of water currently cascading down the first set of rapids seemed to be quite a bit more than they remembered. At 3:45, everyone was back on the water. As soon as staff rounded the corner, a halt to progress was called. In 1999, Meta creek had been a trickle, and Outers had walked up these “rapids” in water barely knee deep. The situation had now changed. A full set of rapids had appeared, and although unexpected, they did provide an opportunity for some instruction. 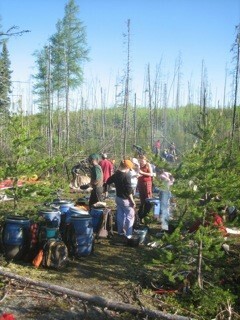 Outers shot through with staff and then proceeded down Meta toward a nice campsite in a burn over. However, Meta Creek was now unrecognizable. Four more riffles were shot using walkie talkies until the campsite was reached at 6:00 PM. The campsite had always been a nice one, both before the burn and after. There was traditionally a nice waterfall that students could bath and frolic in. This year was a different story. At this point, Meta Creek had turned into a raging cataract. The situation was so intense that Haslam put rescue procedures into place, with throw bags stationed before the take out. Anyone swept past the campsite would probably face death or disfigurement in the raging waters below. Once everyone was ashore, the staff held an emergency meeting to evaluate the safety of continuing travel down Meta Creek. It was apparent that any travel on the creek from this point to Melchett Lake was going to be highly improbable with the state of the “creek”. Too much water in too narrow of a channel had turned it into a disaster waiting to happen. A quick portage scouting was conducted. 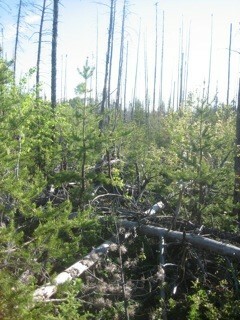 The area had burned in 1998, and then been subjected to the intense blowdown of 2002. In short, it was a huge mess. 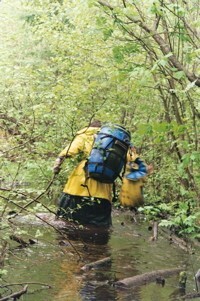 Staff calculated that a seven-kilometer portage would probably be needed to get through Meta Creek. If everything worked well, and both chainsaws held up without running out of gas, it was calculated that it would take three days to get to Melchett. On the other hand, if the chainsaws broke down, or ran out of gas, we would be out of food and then have to turn around and come back out. Alternate routes were discussed, but the high water had really played havoc with options. The only viable option had an unknown at the end, as the key port between lakes had been clear-cut three years previous. It was almost 2 k long, and was probably a mess of tangled stumped and debris. After much discussion, the decision was made to head back up Meta Creek, and then out to the end of Meta Lake. This would shorten the trip by three days. Outers were not happy to hear this, but there was no option. 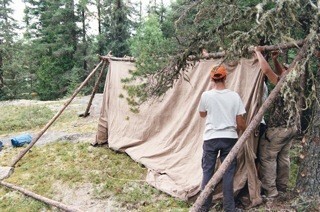 Staff R. Lavoie took advantage of the moment to instruct Outers in the finer points of erecting pole tents. A tent city soon sprang up on the rocky burn over, and despite the bad news, spirits were high as the skies cleared and night closed in. A total distance of 40 k had been covered today. June 20 3 degrees C AM, sunny skies, rain in the evening. Outers slept in until 7:15. The morning was very cold but bright and sunny. There was no hurry today, as upstream travel was the order of the day. A slow takedown occurred with Outers finally on the water by 9:45. Upstream travel proved to be exciting. Short cuts were slashed through side channels to avoid major current. Haslam was in the water chain sawing frequently. All Outers paddled one particularly swift section successfully to the chant of “Give’er” coming from the cheering section. 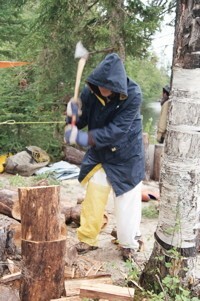 By the time the final C1 was reached at 11:00, everyone was arm weary from the stiff upstream work. Staff R. Lavoie went to work with the chainsaw, and with his unerring internal compass, cut a beautiful port that connected to the first port of the previous day. The crew was quite seasoned by now, and they virtually flew over the port. The bugs had been virtually non-existent for the first four days, but they had now sprung from the bog with a vengeance. A floating lunch was served to avoid the little buggers, and then slow travel up Meta Creek was started. 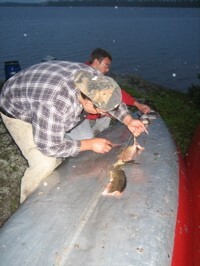 A particularly good fishing spot was located, and enough walleye were caught for a nice addition to the evening meal. A possible campsite was indicated on the maps just before Brace Lake, and upon exploration, it was discovered to be quite beautiful. Spruce and jackpine lined a spectacular rocky point. It proved to be one of the nicest sites of the trip. Pole tents rose out of the bush as the sun began its retreat behind large bank of clouds. 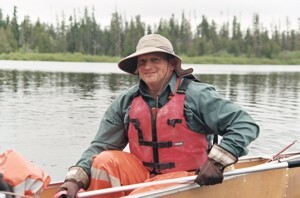 An excellent kitchen was built under a sheltering jack pine, and brigade Leader Trent fried up all the pickerel fillets. Rain began around 9:00 PM and everyone was in bed by 10:00. Outers woke to a beautiful clear windless morning at 5:30 AM. The campsite provided some spectacular views of early morning splendor. The paddle down Meta Creek and Meta Lake became one of those memorable mornings, an effortless paddle over placid waters. The only fly in the ointment was a series of injuries and illnesses that began to manifest themselves among the students. The 20-foot Quetico was renamed to “The Red Cross Canoe”, as one Outer after another was swapped into the middle to relieve their aches and pains. Reggie ended up a permanent passenger, felled by stomach pains, but eventually cured by Nurse Clavet. As the Outers approached the main body of Meta, navigation proceeded by hopping through a series of islands. The last open water crossing brought the Outers to the point of the last bay of the day, just as a massive electrical storm moved in. A hasty crossing of the bay brought the Outers into the lee shore just as the wind began to get quite interesting. Camp was reached at 12:00 noon. 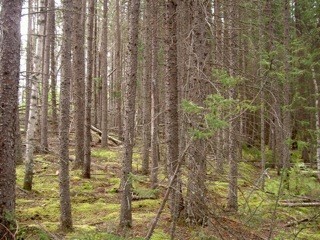 The site was a black spruce stand in a sheltered mossy area at the back of a bay. It had suffered greatly from the blowdown, and looked like someone had thrown a box of giant toothpicks around. Two chainsaws started cutting and the Outers began clearing in earnest. Within an hour, a very nice campsite emerged. 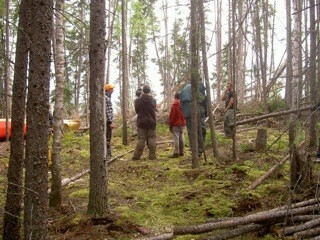 A trail was found leading out of the camp, and was followed to a large bear baiting station. However, since the cancellation of the spring bear hunt, nobody was too worried. Promotions were met with lots of enthusiasm, and even a couple of pranks, mostly related to one new Brigade leader’s “anger management” issues. Camp retired fairly late. Tomorrow would be the last day of the trip. Camp was awakened at the ripe old hour of 5:00 AM. We were hoping to meet the bus by noon. The port that faced us was a very challenging one. It was recorded at 1. 8 k, but Outers were to find out that it was quite a bit longer than that estimate. 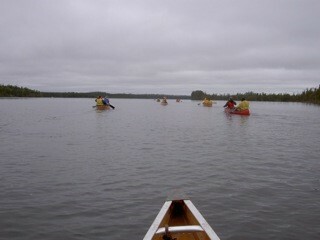 Paddling began at 7:00 AM through drizzling rain accompanied by east winds. Haslam’s maps did not show the entrance to the port, so he relied on his defective memory and ended up one bay to far. 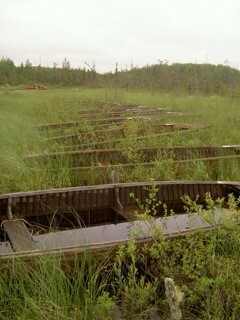 However, it was not a waste of travel, as the outers saw an extremely interesting “Boat Graveyard”. For many years, Meta Lake Lodge has been using wooden boats. When their lifespan was finished, they were towed over to the back of this bay and left for dead. Shortly after paddling by the boat graveyard, an employee of Meta Lake Lodge called Max came racing over in a boat to inform us that we were in the wrong bay. Max showed us the entrance to a winter road that some miners had pushed in, but we decided to stay with the tried and true portage. Portaging began around 8:30. R. Lavoie and Jean V.H. went ahead to clear. The port had an atrocious landing and three major wet spots on it. Although not as bad as the Stone-Ara port, it was quite a bit longer and proved to be a challenge for everyone. At approximately noon, all Outers were finished porting. The bus had arrived at 11:25, but loading could not proceed immediately. 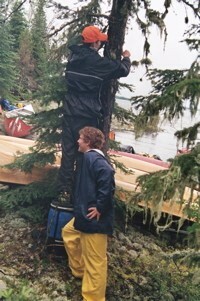 The bus driver had forgot the cam-buckle tie downs, so most of the bow and stern painters had to be removed from the canoes and used to tie them down. The Outers shop was reached by 3:30 PM, and clean up was finished by 4:00. The trip had been one of unusual circumstances, but the Outers had risen to the challenge. Many were disappointed to have not obtained the planned destination, but all agreed that the journey had been worth it. Meta-Not even will go down in Outers history as one of the highest water situations we have ever faced. Next year we will be back on the Steel!